Thus the aged and much revered bishop spoke, in full knowl­edge of the outcome. His martyrdom was sealed. His life had stretched from the days of the apostles till the middle of the second century, and on a February day in about 156 he moved on with honor to the church enrolled in heaven. We first meet Polycarp as the relatively young bishop of Smyrna when the aging Ignatius of Antioch was on his way to mar­tyrdom. It was in Smyrna that Ignatius made that famous rest stop on his final journey, and Polycarp was the only individual on record to whom the great martyr ever addressed a personal letter. In the years that followed, Polycarp gathered Ignatius’ letters and passed them on to others. Irenaeus, who was bishop of Lyons in the latter half of the second century, tells us that Polycarp was a disciple of the apos­tle John and indeed knew others who had seen the Lord in the flesh. The witness of Irenaeus is important because he appar­ently grew up in Smyrna. What he says of Polycarp indicates that the bishop of Smyrna was most concerned about the pres­ervation of the orthodox faith. One incident he reports demon­strates the severity of Polycarp’s attitude toward heresies and heretics. Polycarp, says Irenaeus, once met the heretic Marcion on the streets. “Do you recognize me?” asked Marcion. “In­deed,” replied Polycarp, “I recognize you as the firstborn of Satan!” (Adv. haer 3:3,4). Though Irenaeus hints at several letters by Polycarp, only one has come down to us. That letter is to the church at Philippi and reflects the same concern for truth and orthodoxy we have already mentioned. His letter is filled with, indeed almost made up of, quotes from the Gospels, Acts, and Epistles of the New Testament, as well as the letters of Clement and Ignatius. Some critics have sneered at Polycarp because he is so uncreative and offers no new theological insight. We can be glad he was the way he was. Through Polycarp we have not only a link with the ear­liest days of Christianity, but a faithful transmission of apostolic doctrine as well. No, he was not creative. He was a loyal disci­ple of Christ and the apostles. Near the end of his life Polycarp made a visit to Rome to dis­cuss with Bishop Anicetus a number of church matters, appar­ently including the date of Easter. The Eastern churches were still celebrating Easter on the exact date of Jewish Passover, while Rome was using a specified Sunday each year. Neither agreed to change, but their fellowship was not disturbed. Before he left Rome, Polycarp, at the invitation of Anicetus, led in the celebration of the Eucharist. The two men parted in full agree­ment to leave their respective traditions as they were. 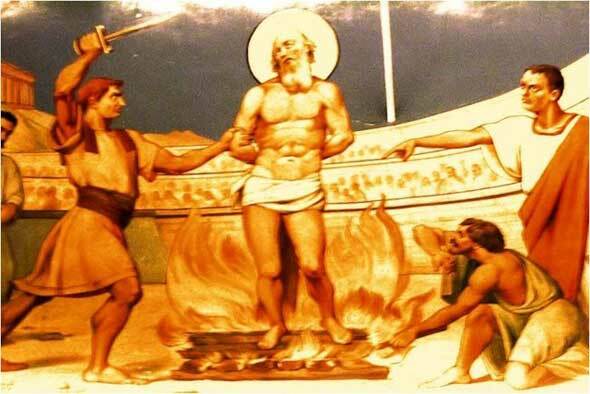 Last of all we have an eyewitness account of the martyrdom of Polycarp. Perhaps by request, the church at Smyrna pre­pared a full account, to be sent to the church at Philomelium and other places. This clear and simple testimony of the martyrdom of an aged saint should bring tears to the eyes of any believer. Some have questioned the record because of the miraculous ac­count of the means of his death. But there is great danger in rejecting a miracle on the grounds that “such things just don’t happen.” Some have done so and thus have rejected the mira­cles of the Scriptures. Below is a selection from The Martyrdom of Polycarp. Please note that the first Christians were accused of “atheism” because they would not sacrifice to the false god of Caesar, and so they were considered as not believing and thus imperiling the ‘divine’ order of the Empire and the Emperor. “…the police captain, Herod, and his father, Nicetes, met (Polycarp); they transferred him to their carriage and sitting down beside him tried to persuade him, saying: “Why, what is wrong with saying, ‘Caesar is Lord,’ and sacrificing, and so forth, and thus being saved?” At first he did not answer them, but when they persisted, he said: “I am not going to do what you advise me.” Since they had failed to persuade him, they uttered threats and hurriedly pulled him off so that as he was descending from the carriage he scraped his shin. And without turning around, he walked along briskly as though he had suffered no injury. As he was led into the stadium with the uproar so great that it [the announcement of Polycarp’s apprehension] was not heard by many…. Comment: Note that what the Christians were asked to do, burn a little incense to Caesar and swear by him is really a ‘small thing’, as it was pitched toward the Church. As the proconsul said, what is wrong with saying, Caesar is Lord? Indeed! It might seem such a small thing to “go with the flow”, do what others are doing which seems so much fun and the like. But it’s not a ‘small thing’ and Polycarp knew what it meant: denying Jesus Christ who saved him. I like Fr. Sparks’ comment that Polycarp’s one letter shows he was not creative. He quoted the Bible. No, he was not creative. He was a loyal disci­ple of Christ and the apostles.” I took a course in seminary, “Creative Ministry”. We make ministry ‘creative’? No, the Lord does. He re-creates us through His Ministry of Word and Sacraments through His called pastors and bishops. Polycarp was not creative: he was faithful. He was a faithful servant of Jesus. Satis est. That is enough and Christ will fill us by His grace for us sinners. Let us pray: O God, the maker of heaven and earth, who gave to Your venerable servant, the holy and gentle Polycarp, boldness to confess Jesus Christ as King and Savior, and steadfastness to die for the Faith, give us grace, following his example, to share the cup of Christ and rise to eternal life; through Jesus Christ our Lord, who lives and reigns with You and the Holy Spirit, one God, now and forever.